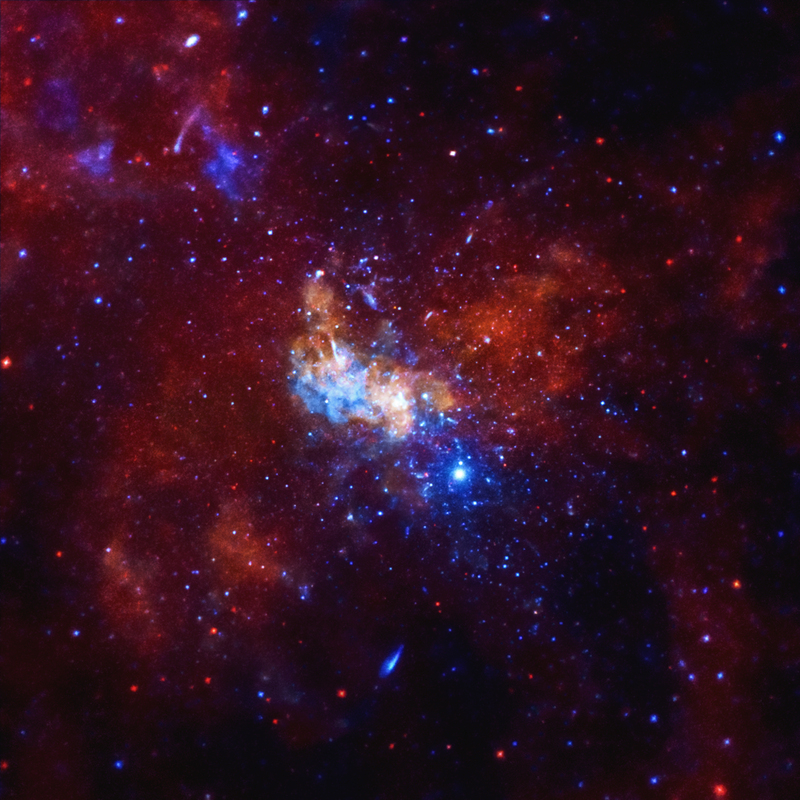 Researchers have found evidence that the supermassive black hole at the center of the Milky Way may be generating neutrinos. Neutrinos are tiny particles that have virtually no mass and carry no electric charge. These particles are unusual because they can travel across the Universe without being absorbed or deflected. Scientists have long been looking for where neutrinos with high energies come from. 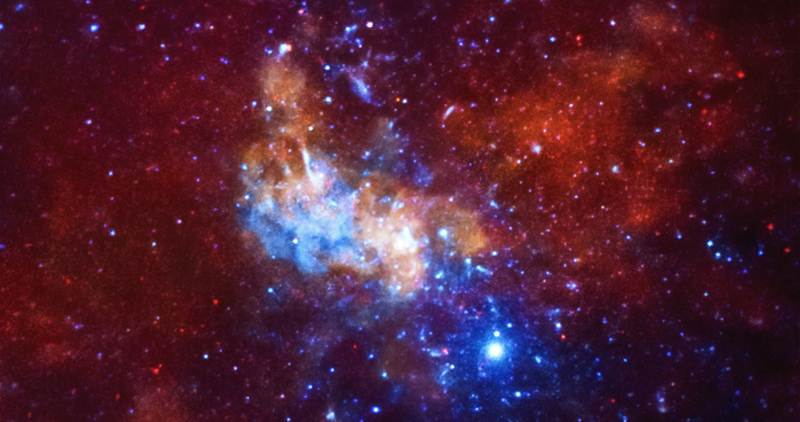 The supermassive black hole at the center of the Milky Way, seen in this image from NASA's Chandra X-ray Observatory, may be producing mysterious particles called neutrinos, as described in our latest press release. Neutrinos are tiny particles that have virtually no mass and carry no electric charge. Unlike light or charged particles, neutrinos can emerge from deep within their sources and travel across the Universe without being absorbed by intervening matter or, in the case of charged particles, deflected by magnetic fields. While the Sun produces neutrinos that constantly bombard the Earth, there are also other neutrinos with much higher energies that are only rarely detected. Scientists have proposed that these higher-energy neutrinos are created in the most powerful events in the Universe like galaxy mergers, material falling onto supermassive black holes, and the winds around dense rotating stars called pulsars. Using three NASA X-ray telescopes, Chandra, Swift, and NuSTAR, scientists have found evidence for one such cosmic source for high-energy neutrinos: the 4-million-solar-mass black hole at the center of our Galaxy called Sagittarius A* (Sgr A*, for short). After comparing the arrival of high-energy neutrinos at the underground facility in Antarctica, called IceCube, with outbursts from Sgr A*, a team of researchers found a correlation. In particular, a high-energy neutrino was detected by IceCube less than three hours after astronomers witnessed the largest flare ever from Sgr A* using Chandra. Several flares from neutrino detections at IceCube also appeared within a few days of flares from the supermassive black hole that were observed with Swift and NuSTAR. This Chandra image shows the region around Sgr A* in low, medium, and high-energy X-rays that have been colored red, green, and blue respectively. Sgr A* is located within the white area in the center of the image. The blue and orange plumes around that area may be the remains of outbursts from Sgr A* that occurred millions of years ago. The flares that are possibly associated with the IceCube neutrinos involve just the Sgr A* X-ray source. This latest result may also contribute to the understanding of another major puzzle in astrophysics: the source of high-energy cosmic rays. Since the charged particles that make up cosmic rays are deflected by magnetic fields in our Galaxy, scientists have been unable to pinpoint their origin. The charged particles accelerated by a shock wave near Sgr A* may be a significant source of very energetic cosmic rays. The paper describing these results was published in Physical Review D and is also available online. The authors of the study are Yang Bai, Amy Barger, Vernon Barger, R. Lu, Andrea Peterson, J. Salvado, all from the University of Wisconsin, in Madison, Wisconsin. Credit NASA/CXC/Univ. of Wisconsin/Y.Bai, et al. Observation Time 278 hours (11 days 14 hours). The presence of a black hole at the galactic centre has always been a keen interest of study for astronomers worldwide. With the Event Horizon Telescope, and with the efforts of Chandra X-Ray, I believe we can closely dive into that mysterious space. My only concern is that its about 25 billion ly away and hence our studies will only reveal the data of the past. That s pretty cool that you can see a supermassive black hole in the image above. I had thought that they were objects that absorbed all light. As far as determining the distance across of the Sagitarius A being 91 light years, I think the calculation can be made with simple geometry since they know the distance to the object as approximately 26k light years and the angle it takes up on the sky. So does the fact that the x-rays arrived before the neutrinos prove that neutrinos travel slower than the speed of light? Sgr A is approx. 26000 LY from Earth. The 91 LY means that the area of space in the picture is about 91 LY across. This light, in other words, these photons were emitted by the star 91 years ago. Now the photon particle of light travels at the speed of light, so the distance it travels is 91 light years and hence we can see it. What we are seeing is, light emitted by the star, 91 years ago and not now. To see the stars condition at this moment, we need to wait for another 91 years. The Fast Facts for Sagittarius A are very interesting. It is stated that the Image is about 12 arcmin across about 91 light years . Can somebody educate me as to how the distance of 91 light years has been measured. The fastest known speed anything can travel in the universe is the LIGHT a speed of 1,86,000 miles per sec. If the light travelled at this speed to show the image to the scientists, it would have taken 91 years. I always wonder how the distances of millions of light years are measured. A supermassive black hole about 26,000 light years from Earth at the center of the Milky Way. About 91 light years across. Low energy X-rays in red, medium in green, high in blue.